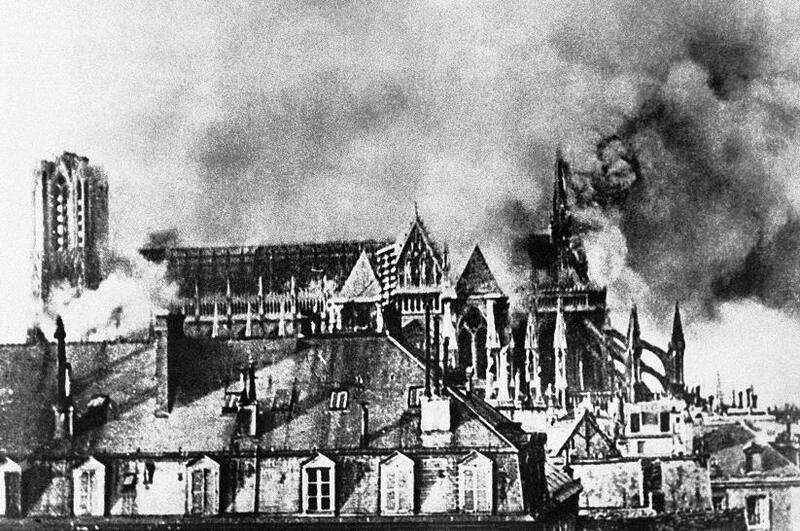 Today is a blessed day for Bishop Maurice Landrieux, for he records no shells hitting Reims Cathedral. Between now and the Summer of 1918, the longest period without any shells landing on or near the cathedral will be just four days. Thousands of rounds will eventually impact the cathedral, the law courts, the theatre, the Grand Hotel, and the surrounding city center. As the tallest object for many miles around, the cathedral makes an easy target. But the people of Reims doggedly document every last shell-strike; they fill and stack protective sandbags; in May 1918, they succeed in removing the statue of a mounted Jeanne d’Arc from the Place du Parvis outside the cathedral before she has taken any significant damage. 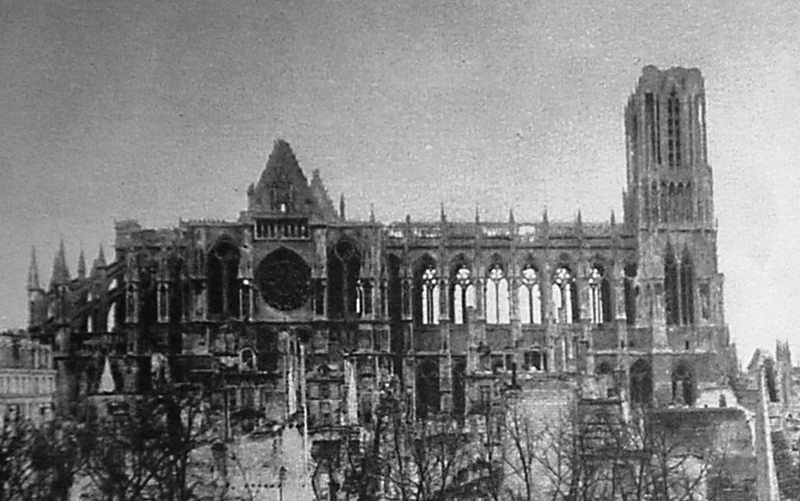 The bombardment of Reims Cathedral is deliberate, and she is not the only victim of the German culture war: cathedrals in Belgium have been damaged by shellfire and arson. 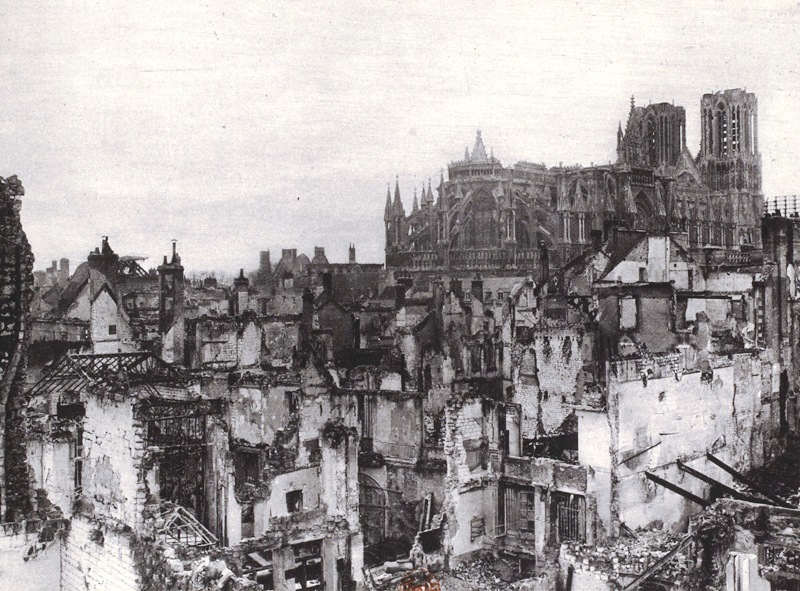 Just four days ago, the famous Cloth Hall at Ypres was hit by a powerful barrage. Verdun, Soissons, Noyon, Cambrai — any French town with a prominent cultural building in reach of German guns suffers similar treatment. On September 4th, General Karl Ludwig d’Elsa’s XII Saxon Corps mistook the delayed return of two German officers who were working under a flag of truce elsewhere on the line for a betrayal by the city — and avenged the perceived wrong by shelling the cathedral. 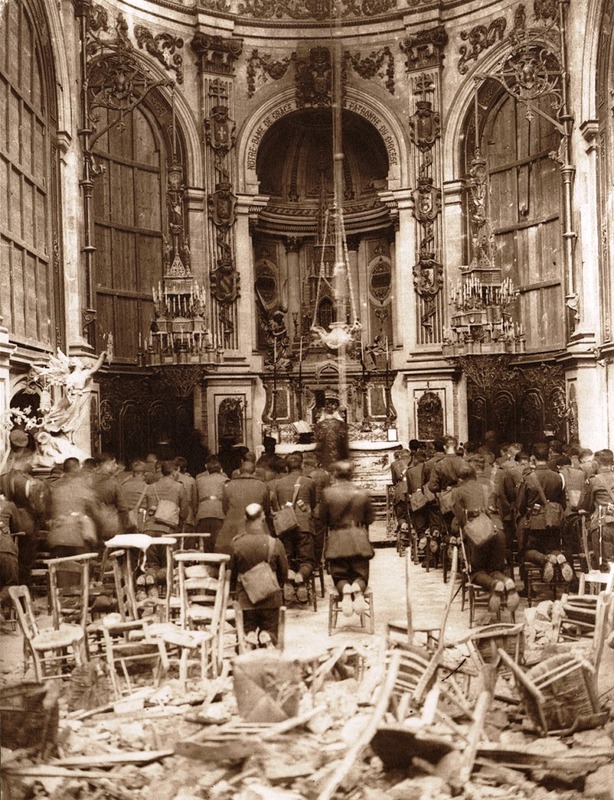 When the Germans then took the city for a few days, the cathedral became a hospital for wounded soldiers, some of whom were left behind when the French Army retook the city. Then on the 19th of September, the roof was hit by incendiary rounds and caught fire. Bishop Landrieux began to evacuate the recovering prisoners, but found his way blocked by French soldiers and an angry crowd of citizens. It was only through his personal intercession that the siege relented after ten minutes, allowing the nurses and stretcher-bearers to carry their frightened charges to another location. Sadly, three helpless prisoners are left behind in the confrontation and found dead the next day, scalded to death by the melted lead roof tiles. The Germans claim that French artillery spotters were operating in the towers, but the Bishop and townspeople angrily deny this. Since that attack, high explosives have fallen here almost every day — a priority that is all the more mysterious because Germany is suffering a shortage of shells for its combat operations. Ancient city of Gauls and Romans, medieval center of learning, Reims is one of the oldest communities in the country. In 496 AD, the Bishop of Reims anointed the first King of the Franks, inaugurating the divine right of French kings. The city’s occupation by a Prussian army in 1871 helped end the last French monarchy, yet the city remains an important French cultural center, and its deliberate targeting is already a source of outrage in the Western world. Postcards and published photographs of the cathedral taking artillery fire will feed the allied propaganda mills, while German denialism and counter-accusation will continue even after the war. The catastrophe of Reims supplies a very sure index as to what passes as the quality of the German mind. Although of all churches the most French, the cathedral of Reims belongs to the whole world, a rare, beautiful and precious structure, hallowed with great memories and endowed with exquisite art. The question is thus very simple: Is the world better with the cathedral of Reims or without it? The Germans seem unquestionably to have decreed its destruction. Of this the record of the bombardment offers ample proof. But as yet the cathedral-destroyers have offered no word, no hint, no suggestion, as to how or why the world will be bettered by the willful destruction of this matchless church. […]Its blackened walls and broken statues are the most formidable indictment the Germans have yet raised against themselves. As an event in the War it stands unique among countless other inexcusable horrors, and it has, therefore seemed worth while to summarize briefly the dreadful doings at Reims, that the real nature of the hideous tragedy may be made apparent. Ferree writes to inform his countrymen of the outrages at Reims while they prepare for war against the Germans. By then, the French regularly refer to Germans as barbarians — just like the Vandals and Huns who sacked the city in the 5th Century, before French kings restored order and created the French nation. They know exactly what sort of war the Kaiser is waging against them.